The genus of plants called Narcissus, many of the species of which are highly esteemed by the floriculturist and lover of cultivated plants, belongs to the Amaryllis family. This family includes about seventy genera and over eight hundred species that are mostly native in tropical or semi-tropical countries, though a few are found in temperate climates. Many of the species are sought for ornamental purposes and, on account of their beauty and remarkable odor, they are more prized by many than are the species of the Lily family. In this group is classed the American Aloe, valued not only for cultivation, but also by the Mexicans on account of the sweet fluid which is yielded by its central bud. This liquid, after fermentation, forms an intoxicating liquor known as pulque. By distillation, this yields a liquid very similar to rum, called by the Mexicans mescal. The leaves furnish a strong fiber, known as vegetable silk, from which, since remote times, paper has been manufactured. There are about twenty-five species, chiefly natives of southern Europe, but some of them, either natural or modified by the gardeners' art, are world-wide in cultivation. Blossoming early in the season, they are frequently referred to as "harbingers of spring." The flowers are handsome, large, varying in color from yellow to white and sometimes marked with crimson. They are usually borne on a nearly naked stem. Some of the species are very fragrant. The leaves are elongated, nearly sword-shaped, and usually about a foot in length, rising from the bulbous underground stem. 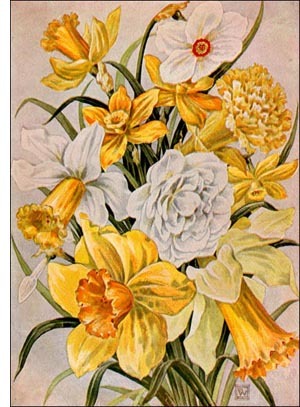 Among the forms that are familiar are the daffodils, the jonquils, and the poet's narcissus.